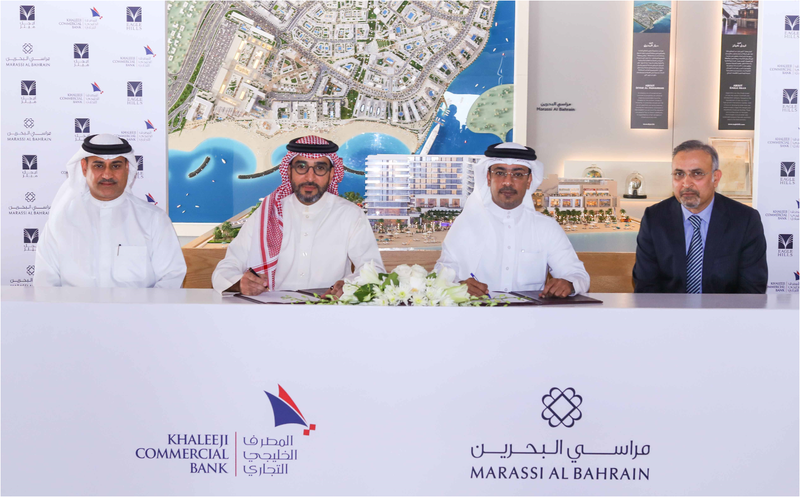 Eagle Hills Diyar, master-planners of the iconic urban development Marassi Al Bahrain, announced its partnership with Khaleeji Commercial Bank (KHCB), one of the leading Islamic banks in the Kingdom of Bahrain, to provide financing solutions in accordance to the principles of Islamic Shari’a. As per the agreement, KHCB will provide flexible payment structures at competitive rates for those wishing to purchase any of the residential units under the umbrella of Marassi Al Bahrain — Marassi Residences, Marassi Shores, Marassi Boulevard and The Address Residences. The agreement was signed by Managing Director of Eagle Hills Diyar, Dr. Maher Al Shaer and the CEO of KHCB, Mr. Sattam Sulaiman Algosaibi. The signing ceremony took place at Marassi Al Bahrain sales center. Khaleeji Commercial Bank clients and residents will be able to purchase their dream homes without straining their budget through a range of real estate financing solutions offered by the bank under the ‘Mazaya’ Social Housing Scheme. In order to provide clients with a smooth and convenient experience when obtaining real estate financing, the bank has assigned a special unit to receive and complete applications. It also appointed a Relations Manager to each residential project in order to reduce approval periods and provide a smooth banking experience for valued clients. Moreover, Eagle Hills Diyar launched five residential projects open to buyers in Marassi Al Bahrain to date: Marassi Residences, Marassi Shores, Address Residences VIDA Residences and Marassi Boulevard. Since their introduction to the market, they generated great interest from local, regional and international investors and end users. The projects are characterised by many attractive features such as modern designs, low rise buildings, spectacular views, luxury facilities, a unique location, sea fronts and a two-km-long sandy beach. They are all within proximity to the international Address Hotel chains, Vida, and Marassi Galleria — expected to become the main shopping and entertainment destination of the Kingdom of Bahrain. Marassi Al Bahrain covers an area of ​​875,000 m2. This unique urban project includes residential units with sea views, hospitality and leisure facilities, and retail outlets. Its capacity upon completion will amount to 22,000 people, with 6,000 residential units and an area of ​​250,000 m2 allotted to commercial activity, making it an important addition to the country’s real estate landscape and a major contributor to the national economy. It is worth noting that buyers have the flexibility to pay as low as 5% upfront with no additional payments until handover under the terms and conditions of the offer. Interested investors are invited to contact Marassi Al Bahrain Sales Centre on +973 7789 0020 or register their interest on www.eaglehills.com. Opening hours of the sales centre are Saturday to Thursday from 8.30am — 6pm.